So I was out working the bees today and I was removing some deep frames from a medium hive. 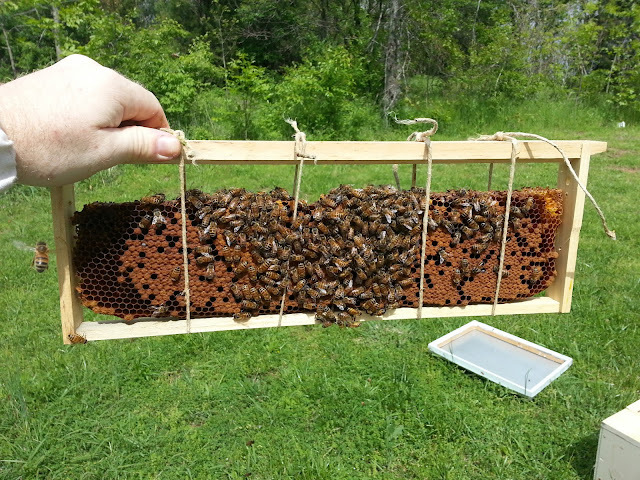 The bees had built comb hanging from the bottom of the frames. It was the only way I had to get a deep nuc into a medium hive last year. However, a lot of the comb was drone and so out of curiousity I started pulling out the drone brood and counting and separating them by which ones had mites and which didn't. Then out of more curiosity, I did the same with the last little bit of worker brood there was on a similar piece of comb. Here are the results: Of the drone brood, I uncapped 56 drones, finding 15/56 (27%) infested with at least one varroa, and two with two mites for a total of 17 mites. Of the worker brood, I uncapped 73 and found 5 infested with a mite (7%) and one having successfully reproduced, showing multiple mites in the cell, in the typical ages of a mite lifecycle in a honeybee cell (1.4%). I did not find any reproducing mites in the drone cells, but as you can see in the picture above, the drones were all recently capped whereas many of the workers were near emergence. First, I have mites. No surprise there, I have been saying that for years. Second, I have plenty of mites. No tiny insignificant population here. This is not a hive that has demonstrated hygienic traits, yet survives nonetheless. Third, the mites obviously prefer the drone brood, infesting at a rate of one in four while worker brood was only infested at a rate of one in fourteen. Fourth, some hives are capable of handling a substantial mite load without crashing or even showing detrimental effects. This hive is about the fourth strongest in this yard of nine. I used it as my cell builder this year. Five, if these numbers hold out, mites are not terribly successful at reproducing in worker brood in this hive, only about 1 in 71 worker cells result in mite reproduction. And for some background data, I measured the cell size of this piece of nearly perfect free form comb and found the cell size to be a consistent 5.2mm. The rest of the comb in the hive is 4.9mm wax or 4.95mm plastic. 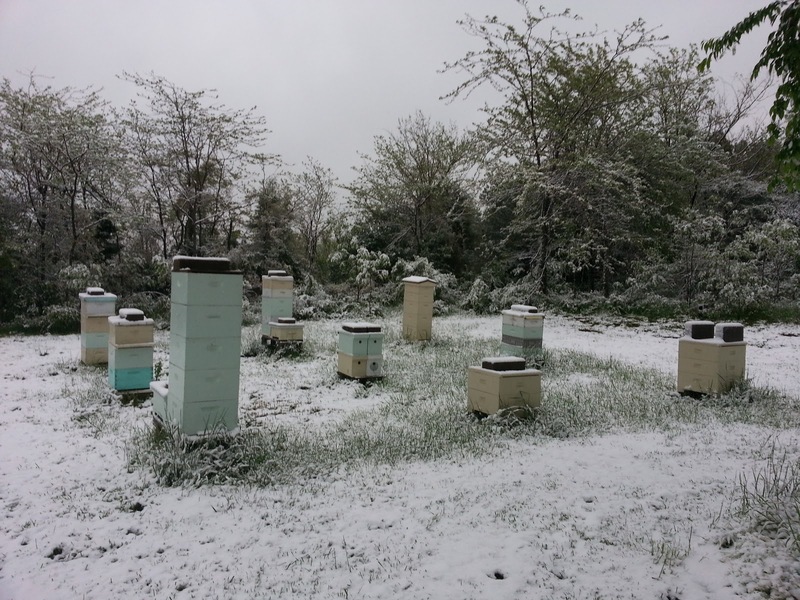 I don't recommend having snow in May at all, especially after you've already grafted and have mating nucs out and all the rest. This is no good. Don't do it, you wouldn't like it. Anyway, that's the news. 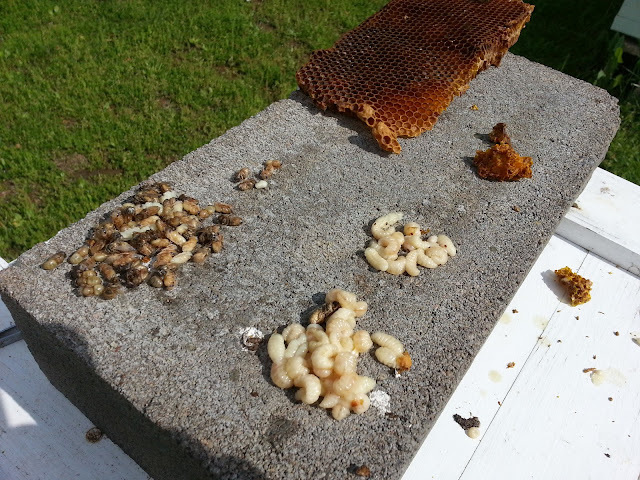 I have reservations to fill and hives to be requeened after that, so there is a bunch of necessity to get these grafts and mating nucs moving and the weather has been extremely uncooperative. I can only hope for a long and moist season or there won't be any honey this year. I will deliver on nucs if at all possible.